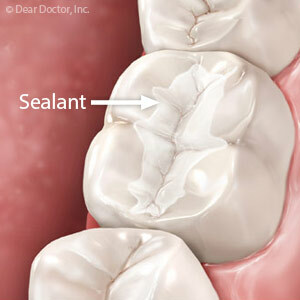 The most common use of sealants addresses a weakness in young teeth that disease-causing bacteria exploit. Deep grooves known as pits and fissures form within the biting surfaces of developing back teeth and in the rear of front teeth. It’s very difficult to reach these areas with daily brushing, so some plaque may be left behind (hence the importance of semi-annual office cleanings).